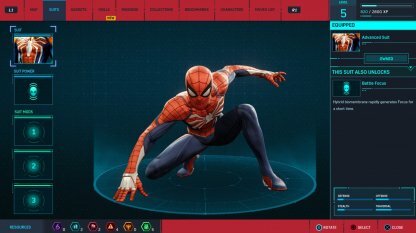 Check this Spider-Man for PS4 list of all suits, suit powers, and recommended & best suits to unlock first! You obtain the skill "Web Blossom" when you craft the Classic Suit. 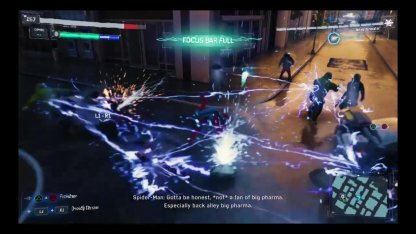 This skill shoots out massive amounts of web to render enemies vulnerable, great for crowd control. The Stark Suit comes with a suit power called the "Spider-Bro". It's a drone firing high-voltage taser shots that hovers around your immediate vicinity, electrocuting enemies and taking them out. The Secret War Suit gives you the suit power "Arms Race". This power temporarily disables all enemy weapons in your vicinity while and stunning them, opening a breathing space. Crafting the Last Stand Suit grants you the "Unrelenting Fury" suit power. Enemies will not be able to block any of your attacks, even if they're carrying shields, when the Suit Power is active. Hybrid biomembrane rapidly generates Focus for a short time. Leap into the air and web everything in sight. Reach Level 3 to unlock. Enemies no longer call for backup when alerted. Experimental AR tech spawns multiple Holo Decoys that stun attacking enemies before decaying. Reach Level 5 to unlock. Magnetically polarized armor plating makes suit temporarily bullet-proof against all enemies, even snipers. Reach Level 7 to unlock. Discharges amplified EMP build-up to stun enemies & disable their weapons. Reach Level 9 to unlock. Calls in a Spider-Bro to temporarily aid in combat. Reach Level 11 to unlock. Synchronizes nano-mesh particles to unleash a devastating wave of negative energy. Reach Level 13 to unlock. Kit bashed high-discharge capacitors temporarily electrify gauntlets, electrifying enemies. Reach Level 16 to unlock. Blast enemies with waves of righteous sound. Reach Level 19 to unlock. 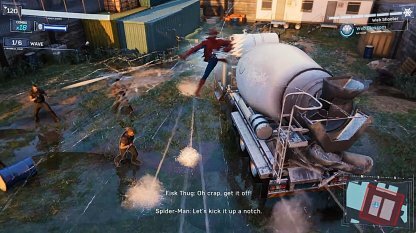 Web Throw enemies without having to web them up. Reach Level 21 to unlock. Assistive nano-musculature temporarily deals MASSIVE damage. Reach Level 23 to unlock. Create a distortion field that can obscure you from non-alerted enemies' vision. Reach Level 26 to unlock. Dynamic semi-liquid smart metal crystallizes to reflect all bullets, except for sniper rounds, back at shooters. Reach Level 29 to unlock. Decrease gravity while in the air. Reach Level 31 to unlock. Wreak havoc with four articulated arms made from rapidly grown mono-atomic iron alloy crystal. Reach Level 33 to unlock. Micro-gyros allow for faster sprinting, and real-time momentum-transfer knocks down enemies. Reach Level 35 to unlock. Experimental magnetic weave generates an energy shield that temporarily absorbs all damage. Reach Level 37 to unlock. Reach Level 39 to unlock. Ventilated concussive technology temporarily sends enemies flying with every attack. Reach Level 41 to unlock. Reach Level 45 to unlock. Enemies cannot block or interrupt your attacks, even if they have shields. Complete all Main Missions, Side Quests, and reach 100% district completion in all districts to unlock this suit. Everyone goes down in one hit, including you. Collect all 55 Backpacks to unlock. Complete Main Mission Act 3 "Pax in Bello" to unlock. Distributed nano-mesh continuously refills current gadget's shots. Complete all Black Cat Stakeouts to unlock this suit. 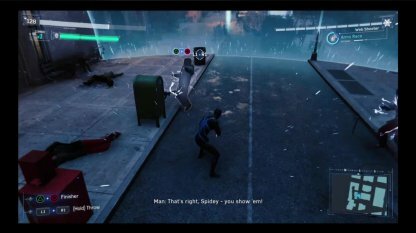 Spider-Man's suits are costumes in-game that change Peter Parker's appearance & unlocks skills that you can activate while in combat. 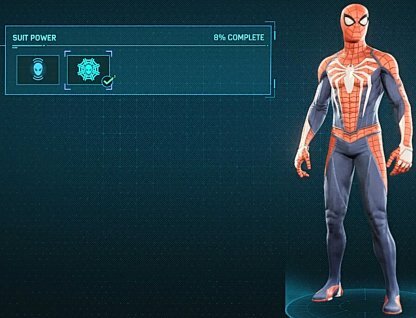 Spider-Man's suits can be equipped with up to 3 Suit Mods to enhance their performance. From improving damage resistance to getting bonus XPs, make sure to equip them before your adventures! 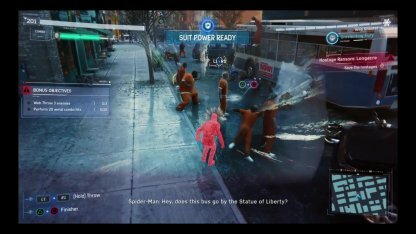 You must craft suits to unlock specific Suit Powers. Once you've unlocked a Suit Power, it remains in your arsenal and can be equipped with any suit, as long as you have already crafted the suit. Suits themselves only unlock Suit Powers, which can be equipped with any suit. They are mainly used to change Spider-Man's appearance in-game.